It's not unusual for manufacturers to slash prices of their current generation products a few months ahead of their next big releases. This helps clearing stock and drives interest in the company, but it also saves customers the anguish of buying expensive full-priced parts right before the next generation is revealed. In the context of the next generation, the discounted processors will still be a good deal, so now’s a fantastic time to pick up some new hardware if you’ve got the cash to spare. The Ryzen 7 2700 is down 25% on Amazon, making it possibly the best value CPU available right now. In games, it’s only a few percent slower than the Intel i7-9700K, which is nearly double the price at $410. 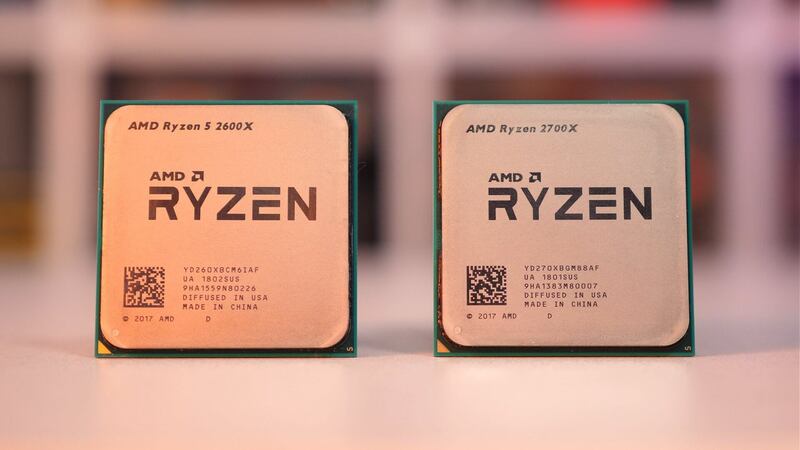 The Ryzen part looks especially good compared to the i9-9900K, which costs 140% more. Meanwhile, a 20% discount to the Ryzen 5 2600 means it annihilates the i5-8400, which performs roughly the same for $35 more. Thumbs up to AMD. Zen 2 will offer up to 16 cores, faster speeds and PCIe 4.0, but it’s also expected to arrive at a bit of a price premium. If you already have a first gen Ryzen part and are looking for a high-end CPU upgrade for gaming, waiting is not a bad idea because the next generation will introduce performance levels Ryzen has never reached before. Professionals should also wait, as higher core counts will push productivity thresholds, too. But for most people, buying discounted parts could be a good idea. Of course, that begs the question: how long do we have to wait? Not long, if new leaks are anything to go by. Videocardz was able to get hold of a list of twelve product names for Asus next-generation X570 motherboards. While mostly just updates to existing products, the list does introduce two new motherboard series to Ryzen, the Formula and the Impact. Formula is what Asus calls their ultra-high-end parts, and they include features like a 2” OLED screen, a built-in VRM water block, and 5 Gbps Ethernet. Impact is the Mini-ITX equivalent. For Asus to introduce these models to Ryzen, Zen 2 must really push the limits of performance. Meanwhile, TechPowerUp noticed that an MSI motherboard BIOS update included a microcode string labeled AGESA (short for AMD Generic Encapsulated Software Architecture) COMBO-AM4 0.0.7.2. An AGESA changes to support new processors, and according to TechPowerUp’s sources, 0.0.7.2 corresponds with the beta version for Zen 2. It’s likely this update is to let AMD or MSI test with engineering samples of Zen 2. After so much anticipation, it seems like Zen 2 is finally around the corner. With AMD declaring that it will arrive before mid-year, we should see the parts debut at or even before Computex in late May. Zen 2 can't be more than 2-3 months away. Still the 2600 and 2700 paired with an overclock are mighty value if you must buy a new CPU now. At this point I am waiting to see what AMD bring to the table, hoping that they can deliver single threaded performance equal or better than Intel's, 12 or 16 cores at the high end. I think after Zen 2 launches 8 cores will start to become mainstream. The leaks point to 8 core parts, a little more than $200 and a 65w TDP. Even the lower end 8 cores probably capable of being as fast or faster than a 9900k overclocked. I think they are worth holding out for at this stage. "Meanwhile, a 20% discount to the Ryzen 5 2600 means it annihilates the i5-8400, which performs roughly the same for $35 more. Thumbs up to AMD." Clamyboy74, Dimitrios and hahahanoobs like this. Intel speculative execution vulnerabilities with Spectre/Meltdown and Spoiler and their Hyper-Threading Flaw its a wonder anyone purchase Intel processors they are a leaky mess for the sake of a few extra frames in 1080p gaming. xxLCxx, Clamyboy74, Dimitrios and 2 others like this. Intel hates these 5 and yet no one seems to talk about them. they go pretty much unnoticed witch is pure madness. xxLCxx and Wessell Urdata like this. Evernessince and Wessell Urdata like this. Few enough to make a 144hz/240hz experience way better with Intel. Not everyone is into multi threaded applications. Ryzen couldn't deliver me enough frames for my monitor, plain simple. The 2600 has 6/12 while the 9400F is 6/6. I'm calling it now, Zen 2 will be delayed until near the end of the year and launch prices will be HIGH. I only got my 2700 a month ago, it's a cracking chip. I have it running with a 300mhz overclock on a Rog Strix X470 board. I paid £220 for the ryzen. Eight cores and 16 threads is more then good enough for my uses. Which vulnerabilities have been exploited to a negative consequence? If they exist but haven't affected anyone then nobody cares. I get 182 FPS with my 2700X in Overwatch. How exactly would dropping more then double the cost of my current processor on a 9900K help? It wouldn't. I'd get 195 FPS and there'd be zero noticeable difference on my 144 Hz monitor. And please "way better"? You can say that subjectively but objectively even Intel's ridiculously overpriced 9900K only holds a small lead over the 2700X in gaming. Unless you are an eSports player or playing a game that does specifically well on Intel, there is very little reason to spend more then twice the cash on a processor that will bring you zero visual benefit. Mostly enterprise cares. Big companies can't afford to take the risk of waiting until their data is leaked or hacked through one of those exploits to then take action. The risk of being insecure for them is potential theft of IP, company files, and customer data. As a customer you should care as well. Would you be fine if microsoft didn't patch those holes and they remains as backdoors into your computer forever? Why even have a password if you don't care about security? Clearly you should care, not everyone's data is just open to the public. That's not going to happen. AMD's partners are already releasing Zen 2 BIOS updates, which means that mass production is well underway. If AMD can make Vega VII on 7nm with no delays, the much smaller Zen 2 die is a walk in the park for them. The price history shows that the 9400F has only been at $169.99 for about a week. On the other hand the 2600 has been at $164.99 since August 2nd and on sale it hits as low as $144.99 to $149.99. So at best you can claim the 9400F is $169.99 right now but since it's only been there for a week that simply isn't a large enough sample size to declare it's the "everyday" price. For example, Amazon had the 2600 on sale for two weeks during black friday sales at $145. That small sample size though does not make the "everyday" price. It's nice to see ASUS releasing it's ultra-high end motherboards on AMD again. That means they have faith that the platform will attract enough enthusiasts to justify the design costs. JaredTheDragon and Clamyboy74 like this. Good to know. I've just recently ported my old 4770K and DDR3 RAM onto a refurbed H97 ITX board for my mini Recording/Streaming machine. Intel will release pcie 3.0-5.0 moterboards and cpus alike amd. so gpus that now supports pci x.x will needing mac win unbutu linuix support and stable drivers. so waiting on stable drivers and games that will support higher speed. adobe programs would benefit of this too. announcing cpu gpu ram AIO would be nice. but the price for all building it from scratch would be to big. new moterboard new pcie x.x gpu new ram ddr4 4600 ram and ssd drive nano m2 drive support that speed. so if we get pcie 4.0 5.0 gpus that taking it out in benchmarks unigine 3dmark and so on you gonna test it in heavy benchmarks thats not are out yet. far cry 7 gta 6 with full rts on new rtx 3000 series and amd newest 3???? z3 seies. So does this mean there are still no high-end microATX motherboards with the newest AMD chipset on the market? I built a new computer a few months back and I wanted to go with Ryzen but couldn't because of that. Well, for one thing, the 9400F Is going to be borderline bad silicon (that's why it is sold as an F SKU - the gpu on the die was defective). That means higher temperatures (which is saying something on Gen 9s) and potential instability down the road. These F chips are literally garbage that Intel would be throwing away if it weren't for their current shortfall in manufacturing capacity. For another, I picked up a 1600 for $109 a couple of months ago, and it runs 4ghz on all cores all day long, which is more than good enough to cap my 1080 at 1440p in every game. It's a placeholder until I can get a 12 core Zen2, then will go into my server to run Plex. Lastly, that same $170 is going to get you 8+ cores with smp at the same clock and probably the same IPC that use half the power. Hmm? would this be worth it to finally step up from an i7-3770k? Look at the Rog Strix X470-I. It's the m-itx version of the board I have (X470-f) and it has recently recieved a bios update ready for the Ryzen 3000 chips. I am cautiously optimistic, coming from a 4770k. We are finally seeing more than 4 cores being worth getting, and if you can get 8-12 cores that each run as fast or faster than my current ones for less than I paid 5 years ago, I am jumping ship and not looking back. I am already unstable at anything over stock speeds so it's definitely time, at least for me. Do Mor3 G likes this. Look at the Rog Strix X470-I. It's the matx version of the board I have (X470-f) and it has recently recieved a bios update ready for the Ryzen 3000 chips. Technically it's an m-ITX board, but yes... easily confusable for the general market. Your right, why did I say matx. I've only been building pc's for 25 years, I'm a little embarrassed now.